Buying a new floor loom is a big decision, so it is important to understand the differences between all the different looms available, before you jump in. When it comes to floor looms, there are 3 main types: the counter-marche loom, the counter-balance loom and the jack loom. I like to think of counter-marche looms and counter-balance looms as being related because the shedding system works similarly with both of these looms – so lets start with them. The counter-balance (C/B) loom is one of the oldest looms around – they basically work with 2 or 4 harnesses that are attached to overhead rollers. The important thing to understand about them is that when you step on a treadle, half of the warp pulls down, and the other half goes up. These looms are called sinking shed looms. Both parts of your warp are in action – the tension on the warp threads that are down, and the tension on the warp threads that are up, is the same. This is a good thing – when you throw your shuttle the weft enters the cloth evenly. Counter-balance looms are great 4 shaft looms and I love them. There tends to be some maligning about them in regards to uneven sheds, when tying up unbalanced weave structures – like 1 against 3. I however, have never found this to be a problem. When I look at the old books like “A Handweavers Pattern Book” by Marguerite Porter Davison, where all the patterns are woven on sinking shed, C/B looms, we see many unbalanced tie-ups, and yet our weavers of days gone by created stunning cloth using these simple looms. The sheds may be smaller on unbalanced tie-ups but, from my experience, the smaller shed on a C/B loom is often as big, or bigger than, the regular shed on a jack loom. Let’s take a look at the counter-marche (C/M) loom. I had said earlier that C/B and C/M looms are related because of their shedding system. The similarity is simple – when you step on a treadle with a C/M loom, both parts of the warp are in action, just like they are with the C/B loom. Some warps threads go up, and some go down, but what is important is that they both move, and you have equal tension on both parts of the warp. There are two types of C/M looms currently being manufactured – the first is the standard traditional European-style loom, which requires quite a bit of space, especially if you want a wide one. Then there is the newer, parallel-C/M loom, which are much more compact. The first thing you need to know is that all C/M looms have two sets of lamms, which require double the tie-ups – there is no getting away from that with a C/M loom. You have an upper set of lamms that move down, and a lower set of lamms that move up. If you are tying-up for a pattern on a jack (rising shed) loom, you would tie-up the lower lamms exactly like it is in the pattern, and you would tie-up all the remaining shafts to the upper lamms. The easiest way to remember this is that upper lamms are at the top and the only place they can move, is down, and the lower lamms are at the bottom, so the only place they can move is up. With the traditional C/M loom, the lamms pivot from a side point. Imagine your arm being a lamm and it pivots from your arm pit. Now imagine tying-up a treadle to your finger tips and stepping on that treadle – your finger tips would move closer to the floor than your elbow. The closer the tie-up to the pivot point (your arm pit), the less distance it could travel. To get around this (and still get an even shed), the tie-cords on all the different treadles have to be fussed with, to get all the shafts moving the same distance. This can be quite tiresome – however, once it is done, you will have a huge, beautiful shed with even tension on both parts of the warp. Below is a picture of a traditional counter-marche loom. You can see that the lamms are pivoting from one side. Parallel-C/M looms are much easier to tie-up. They work entirely differently in that the lamms move parallel to each other – they don’t pivot. This system was designed by Jan Louet in the early 1980’s, and is used in several of his looms. The Hollandia (no longer in production), Spring and Delta all work with this brilliant system. Another feature of these looms is that they are compact, and need little space – they don’t have to be tall or deep like a traditional C/M. They also have an extremely big shed, and are much easier to treadle than any other loom – you work with gravity rather than against it. They are quiet because they use texsolv heddles, and the harnesses are light. Louet counter-marche looms are so sweet that they quickly became my favourite looms. The Spring, in particular, is my favourite simply because it fits my stature, which is a very important thing to consider when purchasing a loom. I am 5’6” tall, and the Spring fits me like a glove. Taller weavers would prefer the Delta. I generally recommend the Spring for weavers 5’8” and under and the Delta for 5’8” and over. This leaves us with the jack loom to look at. Traditionally, all jack looms have been rising-shed looms, meaning the warp sits at the bottom of the reed and on most jack looms the warp comes straight from the back beam into the heddles. When you step on a treadle, you lift (up) the harnesses that you want to move. Usually, rising shed looms have metal heddles and heavier harnesses, to help them fall back to their resting position. When you step on a treadle, you have to sustain the lift until you have thrown your weft pick. When working with many harnesses this can be a real workout. Unlike the previous looms that we have looked at (where both parts of the warp move), only one part of the warp moves on a jack loom, and therefore you have greater tension on what is up than on what is down. 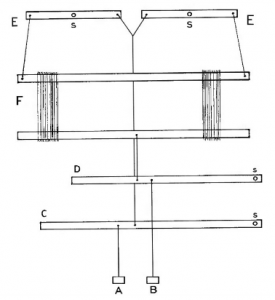 About 15 years ago Jan Louet invented a new type of jack loom, called the David. It is related to the jack loom in that only one part of the warp moves, but it moves down, rather than up. Jan envisioned a loom where all the warp threads sat in the upper position from the get go – all the warp threads are sitting at the top of the reed. You can look from the back beam, through to the heddles, and see that the warp is moving up. When you tie up a David loom and step on a treadle, the moving part of your warp moves down, through the neutral position, and onwards to the bottom of the reed, giving you a fully opened shed. nice thing about this little loom is that it only has one set of (very accessible) lamms, which makes the tie-up much easier than a C/M loom. The David loom is a little feller, and I love how he was named – it is after the biblical story of David and Goliath – he was small, but mighty :^) If you are looking for a small, compact loom that packs a punch, then the David is for you. Hopefully this article helps you understand the differences between loom styles, and gives you a few of things to think about. It is important to have as much information as possible before you make such a big commitment. If you have any other questions about looms in general, or LOUET looms specifically, please check out Jane’s Helpline where there are many more questions answered. By the way, we have all available models of Louet looms in our studio, on beautiful Salt Spring Island B.C. – if you are ever in the neighbourhood, please come see us, and take one for a test drive.